After a long day of using their brains and bodies, most kids will come home and be on the scrounge for some tasty after school snacks to quell their hunger and provide them with a quick boost of renewed energy. While a plate of cookies and a glass of milk may be the oldest and easiest-to-prepare snack around, it certainly is not the healthiest or most nutritious - at least when it comes to the cookies. 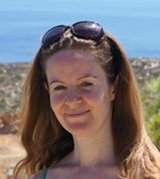 But how do you change such a sweet habit that is both easy, convenient and tasty? 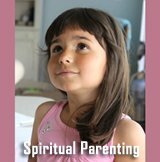 Surely there is not going to be much support from your kids. 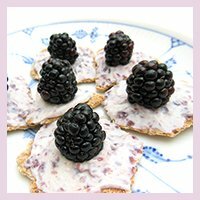 Well, there is a first for everything, and here, relaxed and fun-based taste bud experimentation is a really good tool, and then add a bit of inspiration from a few good healthy snack recipes for kids, and you should be off for a good start. 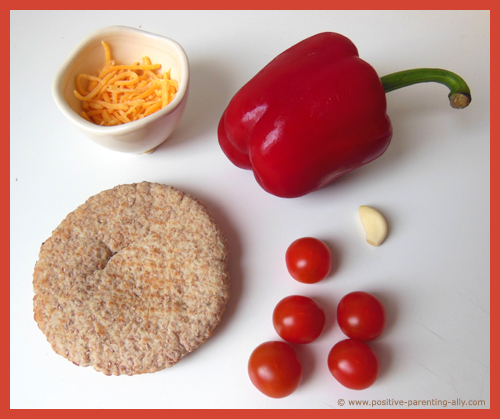 Here I will do my best to help you on the way by providing you with a few very simple and healthy kids snack recipes that I've tried with my son. 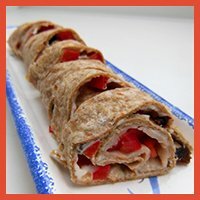 Some of these after school snacks have been top favs for years e.g. the frozen banana popsicles and the crispy veggies. 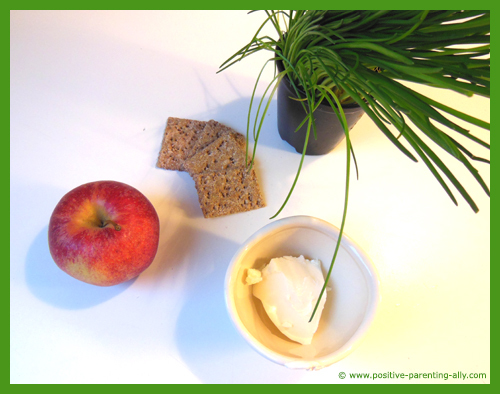 One primary requirement for my healthy snacks for kids is that they are sugar-free. None of these kids snack recipes contain added sugar - the only sugar present is naturally present in the food e.g. fruit sugar. Anyway, enough for now, enjoy! 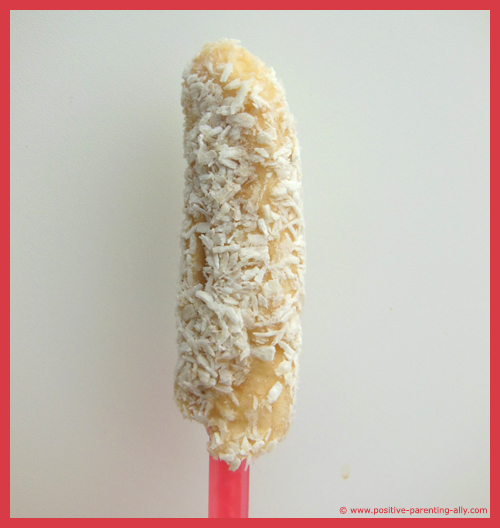 This frozen snack was actually a trick that I learned from my son's kindergarten. So simple and such a delight. 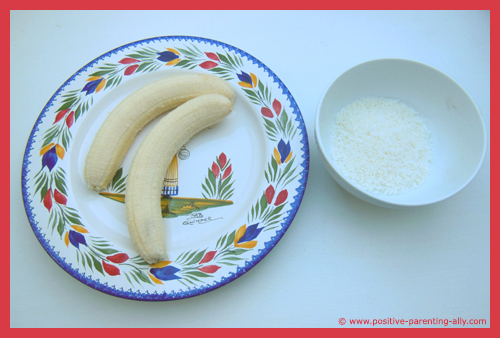 All you need is a banana and some grated coconut (you can buy grated coconut in a bag in any supermarket). 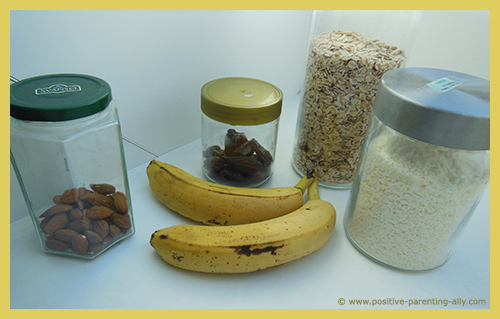 Simply peal the banana or bananas if you want to make several in one go. Roll both halves on the coconut. Put an ice lolly stick in them. Tip: You can also add a bit of healthy protein (I sometimes do that) by mixing the grated coconut with chopped up almonds. My son loves that mix, too. Mmmmmm Pita that Packs a Punch! 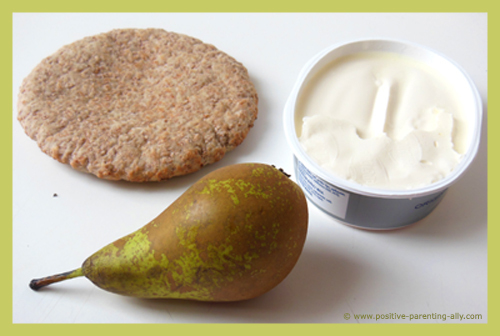 This example of simple, healthy after school snacks is actually more like a mini meal than a light snack. 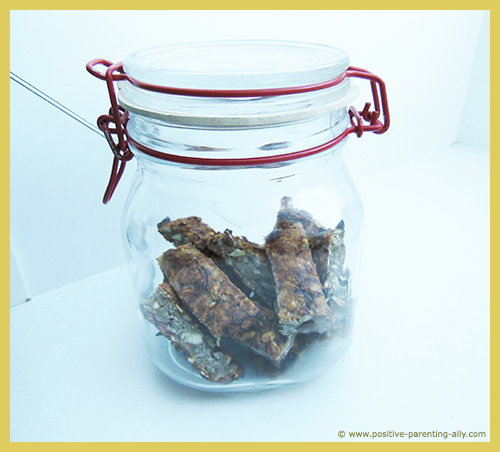 I tend to make such satiating kids snacks when I know that my kid needs to use a lot of energy e.g. just before sports. 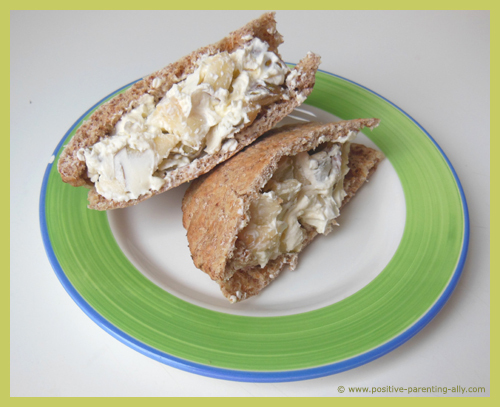 All you need here is mini wholegrain pita breads, cream cheese and pear slices or chunks. Just cut up the pear. Mix it with cream cheese. Easy, yet tasty this is an example of after school snacks that older children can put together themselves. This fun snack for kids is just as fun to make as it is to eat, so invite your kid or toddler to participate in this excitingly edible boat making project. Here is what you need: Eggs (obviously) , cheese, a bell pepper, tomato and salad (tomato and salad are not necessary, but adds the final fun touch). Cut a couple of hard-boiled eggs into wedges. 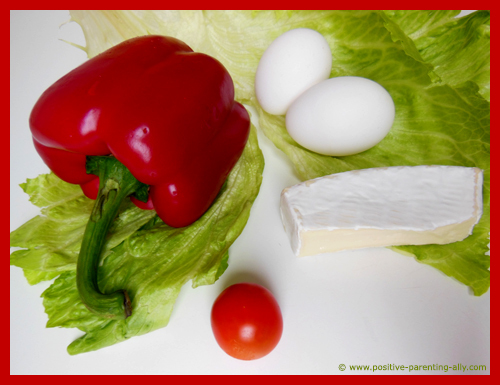 Top each one off with a cheese sail, bell pepper sail or salad sail and you have your very own eggy boats. 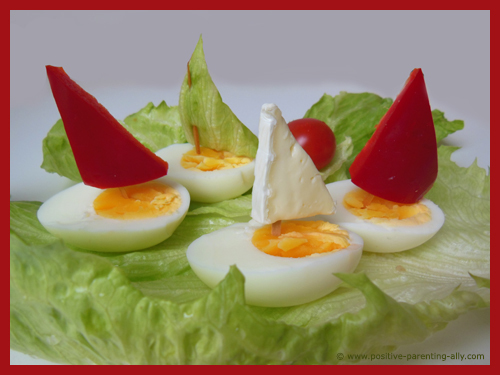 If you want to make a really fancy presentation of them, let the egg boats sail on a large salad leaf and add a tomato as a buoy. Note: If you use toothpicks that are pointy, make sure to observe you toddler closely, so he doesn't end up hurting himself in any way. 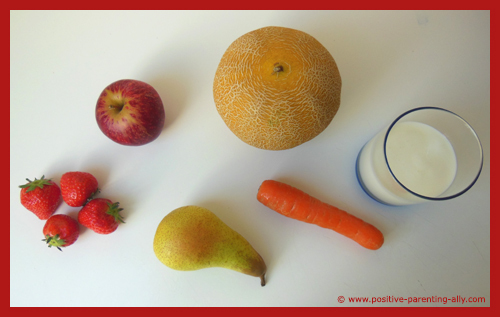 My son is a big smoothie fan, which suits me perfectly fine as this is one of the healthy after school snacks where I can get in plenty of varied fruit and vegetables in one go. All you need is fruits and vegetables (whatever you feel like, really) and some natural yogurt. 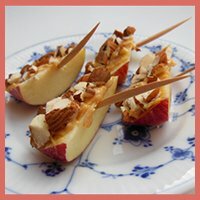 When I made this snack I had pear, apple, melon, carrot, and strawberries available, so that was what I used. Add a medium-sized pot of natural yogurt and whiz it all together with a blender until you have your desired consistency. Serve in glasses with e.g. 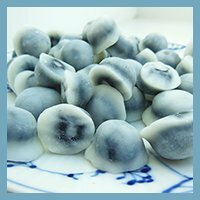 frozen pieces of fruit that work as ice cubes. 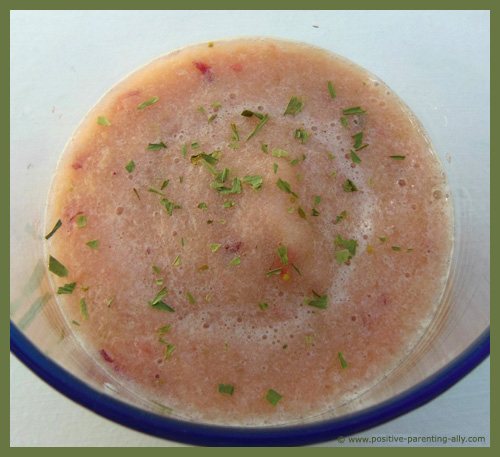 This fruit soup is really just a variation on the above smoothie, but for fun and variation for my son, I call it a soup. It's also bit more exotic as I add the - for many kids - exotic spice of tarragon. 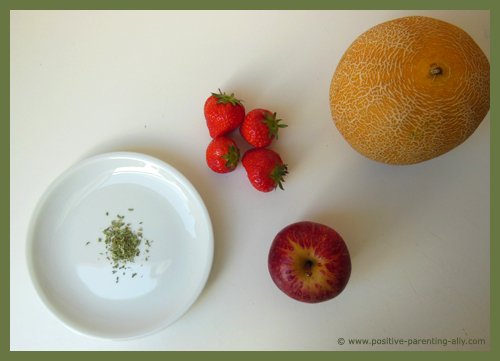 Blend together whatever fruit that you have. As you can see in the picture below, I had melon, strawberries and apples. The water from the melon and apple will create a perfect soup consistency. Add a pinch of tarragon and stir with a spoon before serving in bowls or glasses. 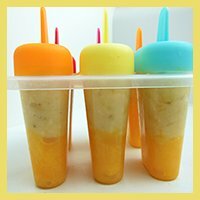 This after school snack is so easy to make, and I often make more than what is needed for one occasion. Then I can freeze some of it in small portions and then simply defrost one portion on the day of use. 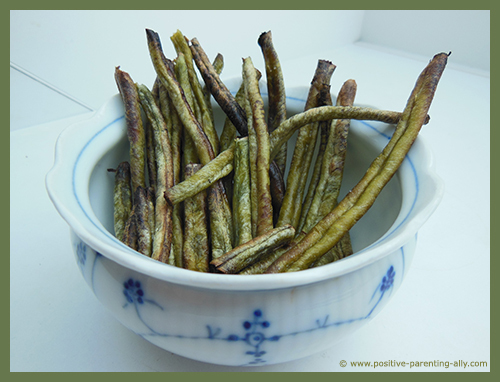 Making crispy veggie snacks in the oven has turned into an all time favorite with son. Here I will share with you the green bean version, but I've tried with several other variants such as chickpeas and black beans and they are just as popular. 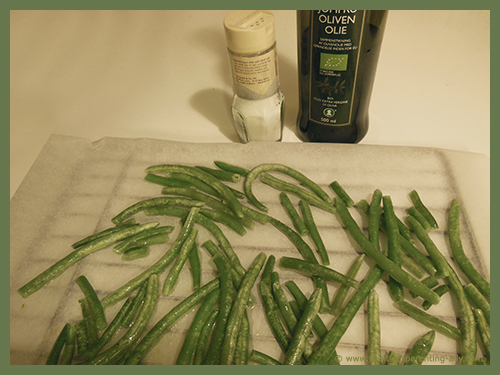 Put your preferred choice of veggies in a plastic bag and add some olive oil. Massage the veggies in the bag so that the oil gets everywhere. Pour the veggies from the bag onto a baking tray and add a bit of salt. Put the veggies in a medium heated oven. (I'm never very specific with the temperature, I just keep a close eye on the foods). Monitor the oven frequently and take out the veggies when they look like they have baked enough. Again, I don't time this, I just go with the flow. Put the veggies on a plate or in a bowl and serve. 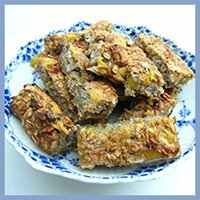 These healthy small banana snack cakes work really great as a healthy sweet treat. I made up the recipe myself, when I wanted to make my son something sweet which wasn't filled with white sugar. 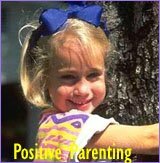 They are so easy to do, and once done, can keep fresh for a long time in a cookie jar. Mash a couple of bananas. Chop up some almonds or nuts along with some dried dates. Mix all this with some grated coconut and some oats. Take the cake out and let it cool. 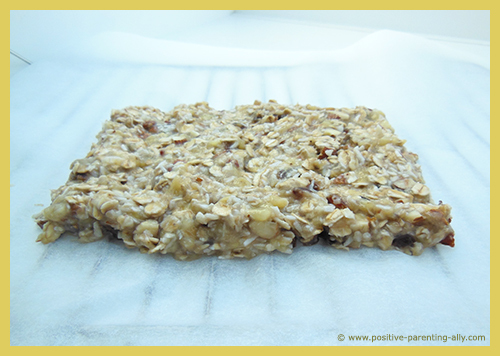 Once cold, cut it into small squares or rectangles and serve. Put the leftovers in a jar for another good time. 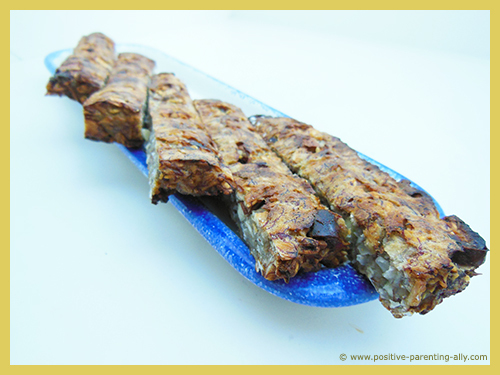 This snack is probably more ideal for the older child as a mini meal before after school activities. 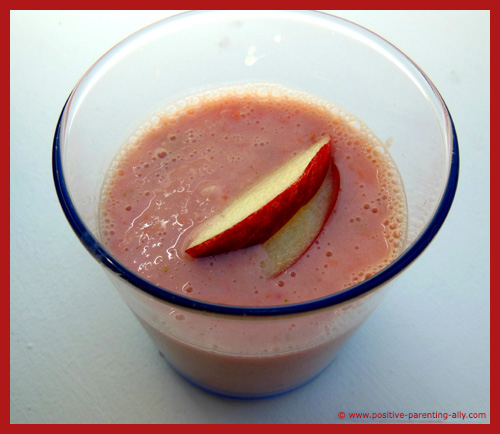 I made this one for my son as a filling energy booster just before he was going to sports. 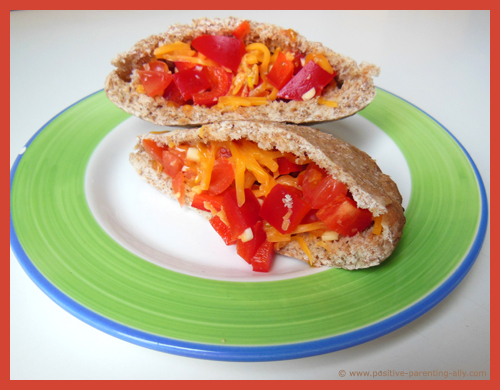 Simply fill a small, wholegrain pita with cheese, chopped tomatoes, bell peppers and garlic to add a tasty and colorful salsa and you have a fast, easy snack. If you have the time, heat it quickly in the oven to make the cheese melt. My son isn't a big fan of cheese, unless it is melted, then he finds it delicious and can't get enough of it. The fresh chopped garlic gives the pita a really nice kick! 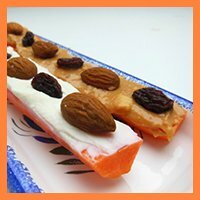 This easy kids snack literally takes seconds to make it is one of the healthy after school snacks I reserve for days when I know I am going to be pushed for time. 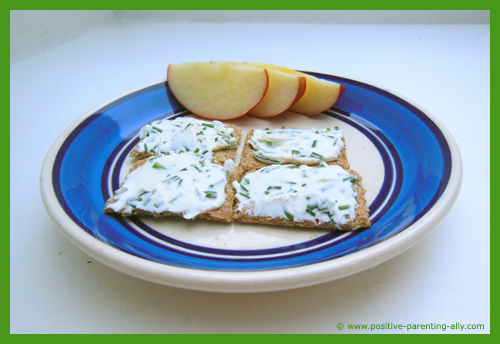 Cut off some chive and mix it with cream cheese. Smear it on some whole-grain non-salty crackers, and cut out some apple boats to put on the side. 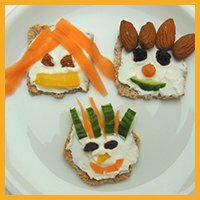 I hope you enjoyed these healthy after school snacks for kids. 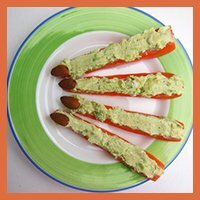 If you would like more recipes for easy healthy snacks for kids, please dive into my other snack pages at the bottom of this page. to Make in no Time.